Yesterday, as Storm Emma covered the country in snow, I was on a delayed and diverted train from London back to Plymouth, wondering yet again “will I make it past Dawlish?”. 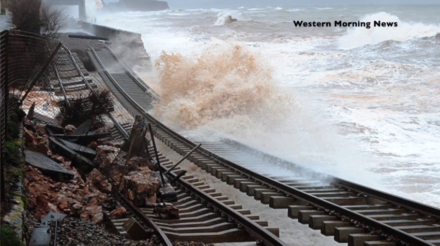 The stretch of Devon railway famously washed away by storms in 2014, leaving the tracks dangling like a rope bridge, is today closed with debris from the sea wall blocking the way. Devon and Cornwall are cut off, yet again. Snow is a rare occurrence, but disruption in and out of the South West is not. That’s why Labour made addressing this problem a key part of last year’s general election campaign in the region. The South West gets a poor deal from government. Decades of under-investment means regional railways are slower, more precarious and prone to disruption, than they should be. Jeremy Corbyn committed Labour to £2.5bn on rail upgrades in the South West, funding the next ten years of essential upgrades for our only train line in and out of the region. The Conservatives choose not to match our pledge. The Tory strategy on South West rail is to make promises and issue press releases to hide inaction and underfunding. Grand soundbites are deployed, including the latest by the transport secretary declaring Dawlish his “number one national rail priority”. Really? It’s a laughable claim as billions are spent on HS2, new tubes for London, tunnels under Stonehenge and the Heathrow expansion. Where are the billions for the South West? The spin, bluster and PR have worked to date and Conservative MPs in the far south west have dutifully played their part in this charade. They welcome soundbites while going easy on pressure that would deliver real improvements. Instead of focussing their fire on ministers who do nothing, they mock and attack those calling for action. That needs to change. Continuing their theme of unimpressive announcements, the government this week published their South West rail strategy. The sham of a document contained no new money, no vision and no strategy. Still, one by one, south west Conservatives lined up to praise this “gradual action”. It is time our region’s MPs stopped accepting this poor deal and found the grit of colleagues who joined forces with Labour MPs to stand up to ministers over the Southern Rail shambles. Party loyalty trumps the needs of our region for many local Tories and they remain wed to parroting soundbites and “making the best of a bad situation”, as one privately remarked to me. Labour has two MPs in the far South West – myself in Plymouth and Ben Bradshaw holding Labour’s fortress of Exeter. After the next general election, there should be five Labour MPs, perhaps more. Plymouth is Labour’s top target outside the capital in May. If we are to defeat Theresa May, it will come in places like the West Country. That’s why transport and fairness in funding matters. The storms in 2014 cost the region £1bn in economic output. Every pound is money that should have been spent in our economy. The South West needs better transport and only Labour has pledged to fund investment in our railway. If you could lay government press releases and spin down as rails, we’d have a railway as sparkly as could be imagined. But spin and bluster doesn’t build tracks – funding and actions do. That’s what we are missing. In May’s local elections, voters across the country have a choice about what kind of Britain they want to see. In the West Country, that choice is stark: a party that invests in our region, or one that says it does while it shuffles funding elsewhere. As a Labour MP, it may seem odd, but I want Conservatives to copy our policy. I want them to match our commitment. I’m in politics to enact change and while we have the Conservatives in Government, I want them to do the right thing and fund our region properly. If they won’t, it’s time for them to step aside and let Labour take the helm. Remember, £2.5bn of railway upgrades with Labour or bluster and promises of jam tomorrow with the Tories. The choice, on 3rd May, is there for voters. Luke Pollard is the Labour and Co-operative MP for Plymouth Sutton and Devonport. Luke Pollard stood for Labour in South West Devon at the 2010 General Election. Born in Plymouth, Luke now works for ABTA leading the travel and tourism sector's lobbying work. He previously worked advising companies on their digital communications and public affairs work including the BBC, The Open University and Sainsbury's. <br /> <br /> Luke is a primary school governor, plays football and hockey and is a self-confessed social media addict. <br /> <br /> You can find out more on his website or on his Twitter feed.